April 26, 2004: Engineers don't often indulge in poetic flourish when discussing the things they build. 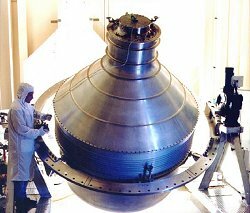 So when words like "beautiful" and "elegant" and "artful" frequently cross the lips of scientists and engineers as they talk about the design of Gravity Probe B (GP-B), one might suspect that this spacecraft is truly something special. The probe, which launched April 20th on a mission to test an unproven aspect of Einstein's theory of relativity, is by all accounts a marvel of human ingenuity and know-how. Only recently has it even become technologically possible to build Gravity Probe B, despite the fact that the idea for the experiment has been around since the 1950s. "If experimental science is an art, then I would look at GP-B as a Renaissance masterpiece," says Jeff Kolodziejczak, NASA's Project Scientist for GP-B at the Marshall Space Flight Center. The beauty of GP-B's design lies in part in its ability to create, in the messy real world, a pocket of near-perfection. The goal of the experiment demands it. Researchers hope to detect a bending of spacetime around Earth so subtle that even a minute interference from some outside force or a tiny internal imperfection in the spacecraft itself would mask the effect they're hunting for. Einstein's theory of General Relativity predicts that Earth, by rotating, twists space and time around with it, forming a mild vortex in the fabric of spacetime around our planet. Researchers call this "frame dragging." Most physicists believe the spacetime vortex is real, but no experiment to date has been sensitive enough to detect it unequivocally. The idea behind the experiment is simple: Put a spinning gyroscope into orbit around the Earth, with the spin axis pointed toward some distant star as a fixed reference point. Free from external forces, the gyroscope's axis should continue pointing at the star--forever. But if the region of space through which the gyroscope orbits is slightly twisted, as Einstein's theory predicts, the direction of the gyroscope's axis would drift ever-so-slightly over time. By noting this change in direction relative to the star, the subtle frame-dragging effect can be measured. Left: A spinning spherical gyroscope in Earth orbit should wobble due to frame dragging. It sounds like a straightforward experiment; the trick is in actually building it. The gyroscope's axis won't drift much, only 0.042 arcseconds over a year, according to calculations. (An arcsecond is only 1/3600th of a degree.) To measure this angle reasonably well, GP-B must have a precision of 0.0005 arcseconds. "Every aspect of the experiment has to be nearly perfect," Kolodziejczak says. Meeting this challenge has taken almost 40 years of effort from many bright scientists and engineers, primarily at Stanford University, NASA's Marshall Space Flight Center, and Lockheed-Martin. The Gravity Probe B team had to create the roundest gyroscopes ever made, and set them orbiting Earth inside a force-free pocket. No form of atmospheric drag or magnetic forces could be allowed to penetrate the gyro-chambers. That's tricky because Earth's far-flung magnetic field envelops GP-B and, even at an altitude of 400 miles, Earth's outermost atmosphere exerts drag on the spacecraft. Furthermore, it would be necessary to measure the tilt of the gyroscope's spin axis ... without ever touching the gyroscope itself. The gyroscopes in GP-B are the most perfect spheres ever made by humans. (The experiment actually carries four gyroscopes for redundancy.) These ping pong-sized balls of fused quartz and silicon are 1.5 inches across and never vary from a perfect sphere by more than 40 atomic layers. That means that if these gyroscopes were the size of the Earth, the elevation of the entire surface would vary by no more than 12 feet! If these gyroscopes weren't so spherical, their spin axes would wobble even without the effects of frame-dragging, thus ruining the experiment. 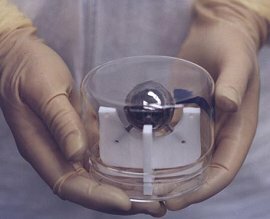 Right: One of the spherical gyroscopes used in Gravity Probe B. Being in orbit allows the spheres to float within their housings as if weightless, but without other controls, the spinning spheres would still tend to drift and bump into the walls of their containers. The reason is that the spacecraft is being slowed slightly by aerodynamic drag, while the free-floating spheres within the spacecraft's belly are not. The GP-B team solved this problem by developing a drag-free satellite. Inside the spacecraft instruments monitor the distance between one of the gyroscopes and its chamber walls with extraordinary precision -- to within less than a nanometer (a millionth of a millimeter). The spacecraft's thrusters respond to any changes in that separation. 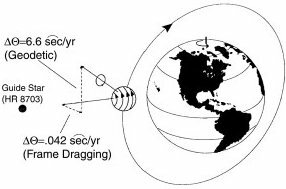 In effect, the spacecraft chases the gyroscope and flies along the same "drag free" orbital path that it does. The spheres must also be protected from Earth's magnetic field. Why? Because a faint magnetic signal from the gyroscopes themselves will ultimately be used to detect the all-important change in angle of their spin axes. The intrusion of Earth's magnetic field would swamp that signal. But how do you block a planet's magnetic field? "We used superconducting bags," says Kolodziejczak. The gyroscope assembly is placed inside lead bags, which in turn are placed inside a large cryogenic container called a "dewar" holding 400 gallons of liquid helium. The helium cools the lead bags to 1.7 degrees above absolute zero (1.7 K, or about -271 째C). At this temperature the lead becomes a superconductor, thus blocking out Earth's magnetic field. The ambient magnetic field within these bags is reduced to less than 3 micro-gauss, which is about the same as in deep interstellar space. Above: Gravity Probe B's big dewar holds hundreds of gallons of liquid helium. The extreme cold also helps create an ultra-low pressure vacuum in the gyroscope chamber; after pumping out most of the gas, the molecules of gas that remain are very cold and thus hardly moving, which means they exert almost zero pressure. In this pristine, high-vacuum environment, the spherical gyroscope could spin at its operating speed of 10,000 rpm for 1,000 years without slowing by more than 1 percent. Finally, it's necessary to measure the gyroscopes' spin without nudging the gyroscopes in the slightest. Once again, superconductivity comes to the rescue. 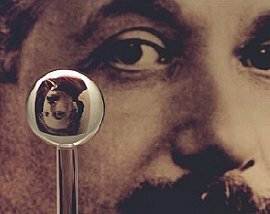 A superconducting sphere, when spun, will produce a weak magnetic field that is precisely aligned with the axis of rotation. The gyroscopes are therefore coated with a metallic layer of niobium of near-perfect uniformity. At the cryogenic temperature in the core of GP-B, niobium becomes a superconductor and it produces a magnetic field when the spheres are spun. By monitoring the magnetic field, engineers can monitor the spin of the gyroscopes--no touching required! Above: A schematic diagram of the SQUID-method for measuring the tilt of a gyroscope. To do this, the GP-B scientists use a remarkable device called a SQUID--short for "Superconducting QUantum Interference Device." Attached to a loop of superconducting wire closely encircling each gyroscope, a SQUID functions as an ultra-sensitive magnetic field detector. SQUIDs can detect a change in this field of only 50 billionths of a micro-gauss (5 x 10-14 gauss), which equates to a change of the gyroscope's angle of 0.0001 arcseconds. A telescope onboard the spacecraft constantly watches a distant star named IM Pegasus. This serves as an external reference point for measuring the tilt of the gyroscopes. IM Pegasus isn't truly a fixed point, though. It will drift ever-so-slightly during the 2 year lifetime of the GP-B mission. Fortunately, astronomers know very precisely how far it will drift, so that motion can be accounted for. Telescopes. Gyroscopes. Superconducting lead bags and SQUIDs. These are odd materials for art. Among engineers and physicists, though, there's no doubt: Gravity Probe B is a masterpiece.